New venture Musicoin uses smart contracts to govern a Pay-Per-Play model for rewarding creators. 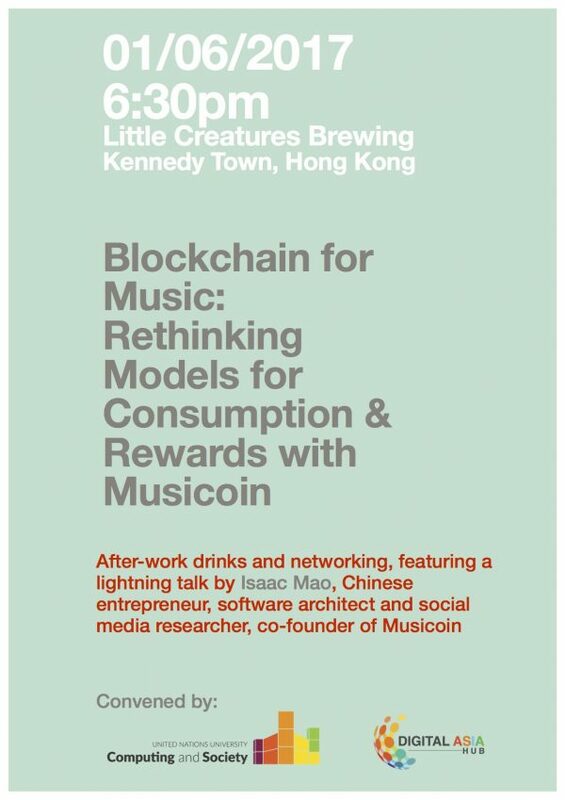 Co-founder Isaac Mao, who is a Chinese entrepreneur, software architect and social media researcher, will give a lightning talk about Musicoin’s journey so far. This was second of Digital Asia Hub and the United Nations University Institute on Computing and Society (UNU-CS) co-hosted networking initiative aimed at fostering engagement and knowledge sharing at the intersection of technology, society, law, policy and international development. You can read more about Musicoin in our interview with Isaac Mao, here. To stay informed of future events subscribe to our newsletter. The Digital Asia Hub is an independent, non-profit Internet and society research think tank based in Hong Kong. Incubated by The Berkman Klein Center for Internet and Society at Harvard University and a diverse group of academic, civil society, and private sector partners, the Hub provides a non-partisan, open, and collaborative platform for research, knowledge sharing and capacity building related to Internet and Society issues with focus on digital Asia. The Hub also aims to strengthen effective multi-stakeholder discourse, with both local and regional activities, and will contribute to – and itself serve as a node of – a larger network of academic organizations: the Global Network of Internet & Society Centers (the “NoC”). The United Nations University Institute on Computing and Society (UNU-CS) is a new research institute at the intersections of information and communication technologies and international development (ICTD) focusing on the key challenges faced by developing societies through high-impact innovations in computing and communication technologies. UNU-CS is nurturing three inaugural ICTD research Labs: the Digital Peace Lab, the Gender Tech Lab and the Small Data Lab. This entry was posted in DAH-UNU Series, Events and tagged blockchain, hong kong, Isaac Mao, music, UNU. Bookmark the permalink.